thanks for following my blog, i welcome your comments and suggestions. “One day you will ask me which is more important? My life or yours and I will say 'mine' and you will walk away not knowing that YOU are my life.” (Khalil Gibran). But Khalil, why didn't you make it easy on the young lady and just said, "YOU ARE MY LIFE" to begin with? Are “Zombies” Stealing our Religion? If you are paying attention to the news, your head must be spinning as you try to follow the recent events in Burma. 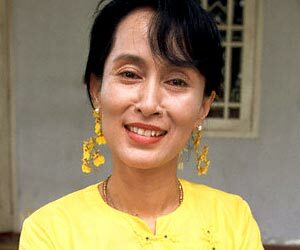 If things continue to move in the direction of openness, we can begin to dream of a free Burma one day. This will open up not only economic opportunities (China is on the ground already) but also many other channels for charity and religious work. I have personally prayed for Burma for many years now and am moderately optimistic about the future there. And who should we thank for these incredible turn of events? A 66-year-old lady with sad eyes and steely resolve, who was willing to spend most of the last 20 years of her life under house arrest, leaving her husband back, who would eventually die without getting another chance to see her, and her children, who grew up without their mom. How in the world could anyone have the strength to do this? Some credit her religion, others her patriotism. Some say it is the hunger for power or the desire to be a martyr. I have no idea what it is but on a human level I admire this woman. And soon you will be able to see her story on the big screen. Read about it here. Buddhism: freedom in the west, prison in the east? And here is the #5 reason I am NOT a Buddhist: while Buddhism in the West presents a more secularized version that promotes freedom from dogmas, in places like Cambodia and Thailand, Buddhism, as it is practiced by the masses, keeps people enslaved to the whims of the spirits and the heavy hand of traditionalism. I once trekked to a house outside of Battambang, Cambodia, where people believed spirits resided. I took my shoes off at the bottom of the steps and walked up to the small living room where worshipers had gathered. The sight completely shocked me. People were kneeling all over the floor, chanting, burning candles, offering fervent prayers, quietly mumbling incomprehensible words to me in a repetitive fashion. The heaviness of the place shook my soul. The bewildered look on people’s faces troubled me. While some might have been fascinated with the sight, I felt oppression in the air. My heart went out to the many people who were there, trying to transact business with the unknown with no apparent success. The hopelessness of the situation permeated the whole experience. Now I know that this by itself does not disprove Buddhism, just like a highly charismatic prayer meeting among Christians would not dismiss Christianity. But the more I travel to SE Asia, the more I am struck with the pervasiveness of this type of folk Buddhism in many countries there. Many people are incapable of making a move without consulting a shaman who will consult the spirits on their behalf. The fear of evil spirits is in the mind of virtually everyone. Businesses are lined with spirit houses and residences have white strings tied around the building to ward off the spirits who would do you harm. As far as I can tell, this is anything BUT freedom and it is easy to see it when you are there. For those who say that Buddhism is not a religion, a trip to Thailand, Cambodia, Laos or Burma will dispel that notion. Buddhism is much of a religion there as Catholicism is in Rome or Mexico. Buddhist Monks are religious figures and going to the temples is not simply a touristic experience. Even the secular calendars of many governments are regulated by traditional Buddhist Holidays with festivals and religious observances. In these countries Buddhism is seen as a path to salvation, some type of salvation, even if not in the same sense as the Biblical salvation from one’s sins. People are desperately trying to appease the “gods” or the spirits. And again, as every man-made religion would have it, it is up to the individual to save himself. And the visit to that “haunted” house showed me that no one there seemed to be certain they had arrived anywhere. The eerie feeling of total helplessness in the face of man’s fate still haunts me every time I think about that experience in Cambodia. Hi Ivan Here’s a extract from The Essence of Buddhism which I think describes why Buddhist may not consider Buddhism to be a religion. I suppose the definition on religion is subjective but this description fits perfectly for me. Buddhism is not a religion as such; it does not propose an external God. It does not seek to replace a person’s existing religious beliefs, only to supplement them. The Buddha, in all likelihood, would rather his followers describe themselves simply as Followers of The Way. Yes, Graham. I have found that book by David Tuffley to be very helpful. But I also agree with you — there are many versions of the Buddhist faith. And who knows really what The Buddha would say since he didn’t really record his thoughts? Actually, anyone can download that book for free and I highly recommend it. http://www.smashwords.com/books/view/26233. Thanks for the comment!